Perhaps the most distinctive feature of the new building is its red brick façade, directly referencing the original building, which was something of a showpiece for the bricklaying craftsmen of the day. Located on an historic transport route between Christchurch and the ferry terminal, the new Woolston Community Library stands on the aptly named Ferry Road, replacing the Woolston Community Library built in 1871. It is one of the last Council community facilities to be rebuilt following the 2010/2011 earthquakes. From the beginning, the design team was determined that the new Woolston Community Library would embody the spirit of Woolston’s industrial past and provide a welcoming, usable space for its people, both now and in the future. The building design comprises three main areas: an outdoor courtyard, the library and the community hall. An existing driveway running the length of the building was repurposed into a pedestrian laneway connecting from Ferry Road through to the upgraded carpark. A new pedestrian connection to a daycare center to the north of the building further strengthens the project’s integration with the wider urban context. Perhaps the most distinctive feature of the new building is its red brick façade, which directly references the original building, which was something of a showpiece for the bricklaying craftsmen of the day. The impact of this brick is heightened by a restrained use of materials - black steel and timber - and the simplicity of the form, which is reflective of traditional local architecture. In a modern take on craftsmanship, Ignite has carefully worked the bricks into a decorative façade through the use of protruding bricks, as well as vertical and horizontal bonds. From Ferry Road, there is an appealing symmetry to the exposed steel beams that rise over the external courtyard, in contrast to the asymmetric brick façade of the library. This open, timber-beamed ceiling is inspired by the traditional veranda, echoing the style of nearby historic buildings and inviting people to enter the courtyard. Within the courtyard, the openness of the space is softened by a single Japanese Maple planted in the centre, with suspended lights above. 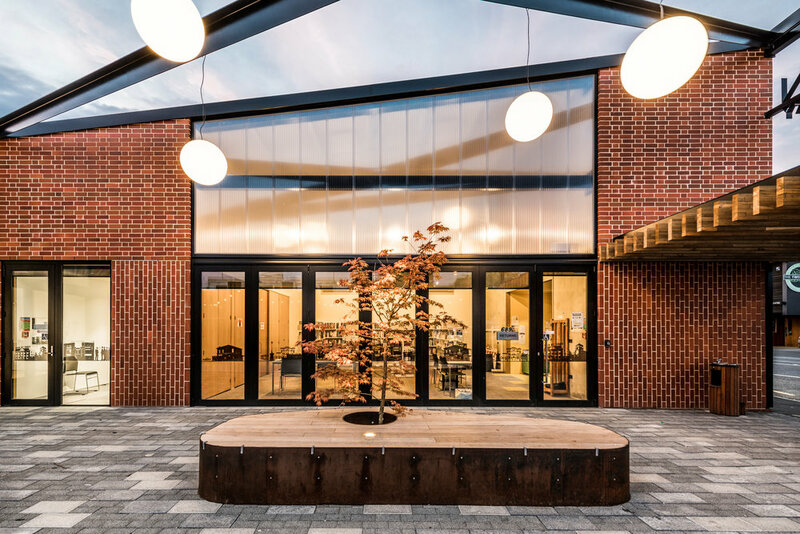 All internal spaces can be used in various ways: glazed, bi-fold doors in the library and community hall open out onto the courtyard; bi-fold doors to the north of the building connect the community hall to the carpark. This flexibility means that the building can be used for larger community events, such as market days. The building’s contemporary design values and materials specification is tempered by the thoughtful inclusion of the few surviving artefacts from the original Woolston Community Library. As far as possible, materials were sourced from the region, most notably the red bricks which were supplied by the only remaining brick manufacturer in the South Island. As with all projects, there were long hours and occasional weekends. This was no hardship for this project team, who enjoyed every bit of the process of working together. “The build”, says Szymon, “unfolded in an amazing atmosphere” – and this is reflected in the completeness of the outcome.